Although most anglers target whiting using conventional baits like yabbies or live worms, the trend of using small popper lures is ever increasing. Whiting love to follow a moving bait and with increase of small popper fishing there are more being unexpectedly hook with this method. Using poppers to target summer and golden lined whiting is the latest craze to sweep the east of Australian’s recreational fishing scene and with the whiting season under way at present it’s a good chance for any one who hasn’t tried it yet to have a go. At this time of the year it’s not uncommon to see small prawns skipping across the surface as they are being chased by fish. A lot of the time these fish chasing the prawns are bream, but some may not realize that whiting can act the same way. When small prawns are moving in or out of the river on the tide and work their way over the shallows whiting will ambush them on or below the surface much like a GT would ambush a herring. This is when very small poppers come into their own. Anglers flick the poppers over the shallow sand banks at the right stage of the flood or making tide so that you have at least 30-40cm of water and bloop away. Flick the popper over the bank, retrieve very slowly with the occasional bloop and if the whiting are hungry they should be all over it like a rash. Try varying your retrieval speed between a fast and slow until you find what the whiting like. If the thought of using live worms to target whiting seems a bit boring or you just love lure fishing, then maybe its time you got your hands on some small transparent poppers. Jackson T-Pivot 35mm can be used to walk the dog, slide and pop across the surface. I would like to take this opportunity to wish every body a safe and Merry Christmas. Offshore: Spotty mackerel to 4.5kg and similar sized spanish mackerel from the Gneerings and the Blinker. Yellow fin tuna and some quality spanish mackerel off the Noosa National Park. School and spotty mackerel off Brays Rock. Sweetlip around the 2.5kg mark in good numbers from the Gneerings. NOOSA: A few mud crabs on the low tide from Weyba Creek and the 1st lake. Mangrove jack and flathead up between the lakes. Quality whiting from the frying pan. Trevally from Noosa Sound. 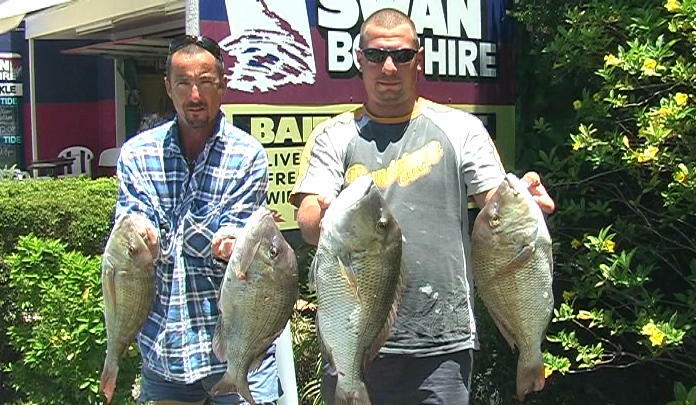 Bream, flathead and mangrove jacks around the snags in Woods Bay. Mud crabs in Weyba Creek. MAROOCHYDORE: A 112cm hair tail eel was taken on a TT switch blade lure in Maroochy Waters Canal. Trevally from the Twin Waters canals at dawn and dusk. Quality whiting from the North Shore and on the banks below Bli Bli bridge. Mangrove jacks to 1kg and a 70cm jew under the motorway bridge pylon and a 80cm jew from the mouth of Petrie Creek. A 76cm jew was caught from the bank in Eudlo Creek over night. KAWANA: Quality whiting and flathead in the basin in the mornings. Trevally and mangrove jacks from the moorings at the Yacht Club and around McKenzies bridge. Bream are taking small poppers around the trawlers. CALOUNDRA: Flathead, bream and whiting from Bullcock Beach. 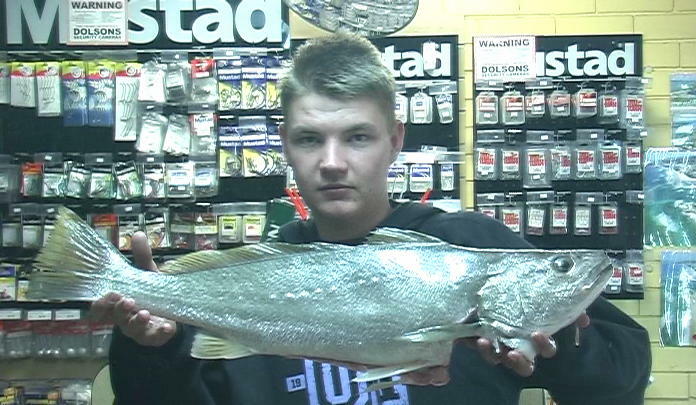 Whiting to 42cm (500g) from the bank near the powerboat club. Mangrove jacks to 56cm from around the bridge pylons in Currimundi Lake. School jew from Military Jetty being caught on live silver biddies. Queenfish, mangrove jack and trevally in Pelican Waters Canals. Bryan Milby did an all nighter in the Maroochy River cod hole and caught this 75cm school jew on fresh mullet for his efforts. 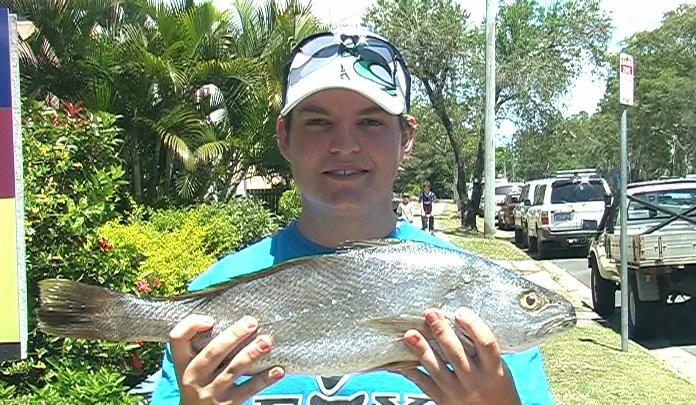 Michael Kuchen fished from one of jetties in the middle reaches of the Maroochy River using frozen herring for this 60cm school jew. Pete Murray the jack hunter strikes again. He had an over night session in the Mooloolah River, where he did battle with these two fine specimens of mangrove jacks. They took fresh mullet strips, with the biggest weighing in at 3.2kg. 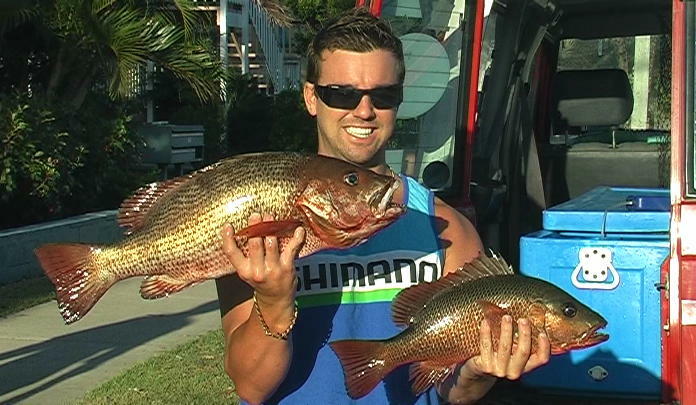 The grass sweetlip are on the chew in close off Mooloolaba. Terry Rogers and Craig Fuller had a morning session on Jeff’s fishing charter at the Gneerings for fish up to 2.5kg.